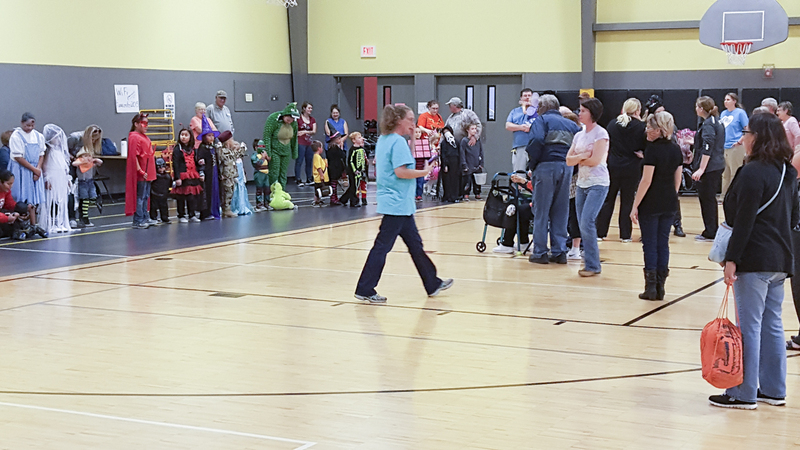 Costume contest entrants gather at the Netawaka Family and Fitness Center 2017 Halloween party. The event will be held again this year on Wednesday, October 24. The sillier, the better… you could win the Costume Contest at the Netawaka Family & Fitness Center’s annual Halloween Party to be held 5:30 to 7:30 p.m. Wednesday, Oct. 24. It’s free and open to the public. It’ll feature much more than just scary costumes: decorated pumpkin contest, free swim night, bounce house for the kids and a chili feed. “We have a number of members-only events for 700-plus members,” said Director Scott Steffes. “But we open this Halloween party to the public because it offers a nice opportunity for children in the area to have a fun, safe, celebration. Steffes noted there has been an increase in visits to the Center since the new “Dollar a Day” special membership offer was recently announced. That offer is good between now and Thanksgiving. “This Halloween party will give people a chance to see the inside of this 30,000 square foot non-profit facility, which includes an 8,000 square foot heated pool, full-size basketball court, top-of-the-line fitness equipment, indoor walking lanes and more,” he said. That includes Joe and Janet Summers of Fairview. The membership records show a particular rise in the number of retirees. Martha Coder of Effingham is one of them. This evening the Center will be good for laughs, too. It’s a chance to put on your worst clothes, meet friendly people and enjoy a good bowl of chili.